ANNABEL: "Beautiful grace." A compound name consisting of English Ann, "grace," and French Belle, "beautiful." Variants include Anabel, Anabella, Anabelle, Annabal, Annabelinda, Annabell, Annabella and Annabelle. Short in height. Red bushy hair. Red eyes. Small white fangs. Wears a variety of clothing but likes to wear combinations of red and black. She was turned at age 11. Every hundred years she ages one year. She actually experiences her years longer than normal humans. 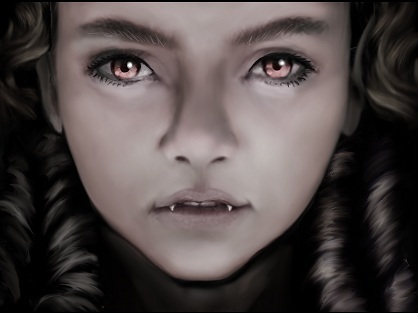 Vampire children remain that age emotionally and mentally, perhaps for self preservation so they do not go insane living as an adult trapped in a child body. Annabelle, however, is more mature for her age. How she handles immortality remains to be seen. No other ages available at the moment. She gets dreams that show the near future (but presently in the books she is unaware of this. When she learned of this ability remains unknown). She has the standard vampire abilities. This means she’s faster and stronger than humans, her senses are extremely acute as are her reflexes. She can fly and turn into a bat. In later years she has shown the ability to transform into a wolf, rat and mist but how she learn these things has yet to be told. She can control humans through mesmerization and communicate with lesser beasts. In 1692 Annabelle Foresight moved with her family to the wilds of Massachusetts. The Vampire Lord Dominic Pratchet killed her parents and left her and her brother Roland for dead. Dominic's wife Eliza turned them into vampires, taught them the things they needed to know and became a surrogate mother to them. As the centuries have passed, Annabelle has become a hero to many, constantly fighting Dominic's forces as a member of the Order of Righteous Vampires. She prefers to drink the blood of animals instead of humans. Annabelle is deeply concerned about the safety of mortal children. She is determined, loyal to family, feels love for others and angry if someone hurts her family. Annabelle is outward friendly,book smart, a quick learner and sometimes acts too serious to make up for her reckless older brother. She tends to pretend to be brave and mock the bad guys. She takes life too seriously and can be bossy. She takes over when she should sit back. She can often make decisions before consulting others. She's afraid deep inside if she doesn’t just make things happen, they will fall apart right away. Before vampirism she loved animals and winced when they got hurt. After becoming a vampire she now sees them as something to eat. In some ways she has lost touch with who she was. She has a deep fear of two men, Hawke the vampire hunter and Dominic, the vampire who killed her parents. NOTE: I added a "NAME ORIGIN" to Dominic's entry below. Labels: Annabelle, Who's Who in the Annabelle Universe?